"The power of the web is in its universality. 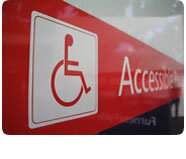 Access by everyone regardless of disability is an essential aspect." (Tim Berners-Lee, W3C's director). You want to know if your website is accessible to everybody or, on the contrary, inaccessible to certain people cartegories. All theses points will permit me to give you an accurate report on your website's accessibility level and will help you to take actions about it. Website powered to you in 0.01933s, with valid XHTML 1.0 Strict, CSS 2 and WCAG level AA · Printer friendly.